There are many situations in which open-cell foam achieves the same permanent result as closed-cell foam, but at a lower cost. Open-cell foam has qualities that make it perfect in some situations, where closed cell is correct in others. 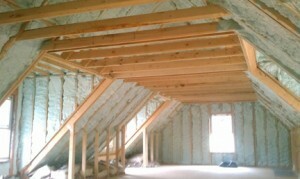 A general rule is if you do not need a vapor barrier and have 2×6 or deeper framing, open-cell foam is a viable option. 1. R-Value- Open-cell foam has an R-value of 4.3 per inch. Due to code requirements, most modern homes in PA are built on 2×6 framing. This scenario provides an apt alternative in the lower cost open-cell foam, which can achieve the same great result as closed-cell foam by applying more of it. If you have the space and a vapor barrier is not required, open-cell foam is the perfect application. 2. Air Barrier- Any application over 3 inches of open-cell foam creates an air barrier, and that air sealing quality is one of spray foam’s many claims to fame. Air sealing is as important, if not more important than R-value. Homeowners will benefit from an air barrier with both open and closed-cell foam. 3. Sound Reduction- Open-cell foam has excellent sound dampening properties. Sound waves are transmitted in many ways, including air movement. Semi-rigid cells and air sealing qualities allow foam to trap sound waves most efficiently.